Synopsis: In the nineteenth century, long before film and television brought us explosions, car chases, and narrow escapes, it was America's theatres that thrilled audiences, with "sensation scenes" of speeding trains, burning buildings, and endangered bodies, often in melodramas extolling the virtues of temperance, abolition, and women's suffrage. 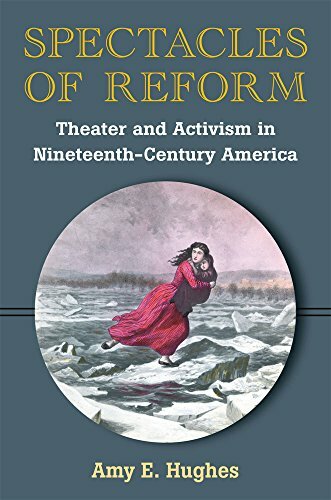 Amy E. Hughes scrutinises these peculiar intersections of spectacle and reform, revealing the crucial role that spectacle has played in American activism and how it has remained central to the dramaturgy of reform. Hughes traces the cultural history of three famous sensation scenes--the drunkard with the delirium tremens, the fugitive slave escaping over a river, and the victim tied to the railroad tracks--assessing how these scenes conveyed, allayed, and denied concerns about the rights and responsibilities of citizenship. These images also appeared in printed propaganda, suggesting that the coup de theatre was an essential part of American reform culture. Additionally, Hughes argues that today's producers and advertisers continue to exploit the affective dynamism of spectacle, reaching an even broader audience through film, television, and the Internet. To be attuned to the dynamics of spectacle, Hughes argues, is to understand how we see. Her book will interest not only theatre historians, but also scholars and students of political, literary, and visual culture who are curious about how U.S. citizens saw themselves and their world during a pivotal period in American history. "American Historical Review"--T. Gregory Garvey, College at Brockport, SUNY "American Historical Review ""
American Historical Review--T. Gregory Garvey, College at Brockport, SUNY "American Historical Review ""